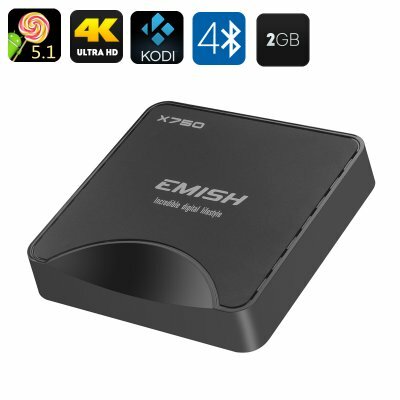 Successfully Added EMISH X750 Android TV Box - 4K, Android 5.1, Amlogic S905 Quad Core CPU, Bluetooth 4.0, Kodi 15.2 to your Shopping Cart. Get a super upgrade for your TV with the EMISH X750 Android TV Box, coming with 4Kx2K support, Android 5.1 interface, Amlogic S905 Quad Core CPU and more. The EMISH X750 is a compact Android TV box meant to enhance your home entertainment. Full of functionality and reasonably priced, it’s a great option for those looking for something extra when it comes to home movie nights. The TV box supports 4Kx2K resolution, so you will see all the latest blockbusters in great quality. Android 5.1 offers easy navigation and an intuitive interface, a simple and easy way to stay in control of your entertainment. Thanks to Kodi 15.2 that is pre-installed, you will have a ready to go media player and a powerful free media content source. Go ahead and upgrade your watching experience even further by hooking up a pair of external speakers. With Bluetooth 4.0, you won’t need to mess with wires — simply connect the TV box to Bluetooth speakers or a Bluetooth headset. Easy sharing is enabled with DLNA/Airplay and Miracast support. The Amlogic S905 Quad Core CPU is one of the highlights of this model and lets you enjoy a smooth performance and fast multitasking. The 4K TV box comes with 8GB of internal storage and supports an additional 32GB externally. With 3 USB ports and a micro SD card slot, you will also have lots of external content source options. The EMISH X750 Android TV Box comes with a 12 months warranty, brought to you by the leader in electronic devices as well as wholesale Android TV boxes..